The earth is spinning and so are you! What if you were to break apart everything you are doing that creates chaos in your life, one thing at a time, one idea at a time? What we seem to do is pile everything on top of the other at warp speed (we become paralyzed from it all). Sometimes we have to make the hard choices regarding our career, home, and people around us – good and bad. More than we are doers, we are deciders! 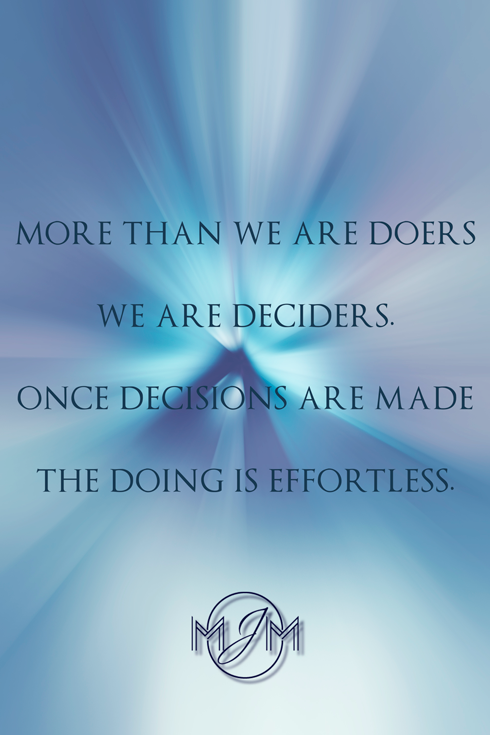 Once decisions are made, the doing is effortless. We have to get out of our own way. How about being good to you first instead of being dragged along by the ebb and flow of life? It will stop the confusion and give you a moment to breathe, think, reflect and relax. You know you can’t change other people but can change your attitude and your perspective on situations. Listen to your instincts. Time passes quickly. It should be well spent. I am actually old enough to be telling you this.